Beachcombing the low-tide regions near old canneries will sometimes reveal tiny glass bottles and fragments of masonry jugs. These relics are reminders of some of the darker social issues of cannery development: drugs and alcohol, often provided by employers to keep workers in debt to the company. 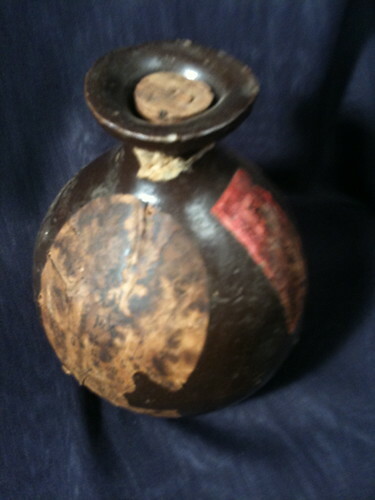 The tiny bottles held opium, and the masonry jugs held rice wine, both available for purchase at the company store. Opium was common in the Western US, where large populations of Asian migrant workers served mines, canneries, and railroads. Although supposedly banned early in the 20th century, in reality it could be readily purchased and distributed with a special tax stamp. 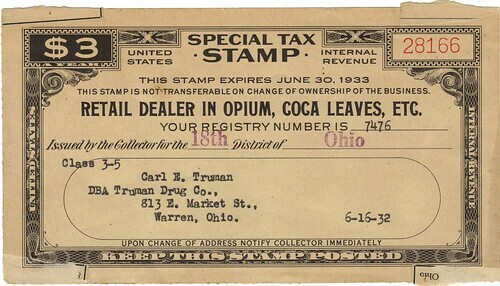 Federal prohibition on Opium went into effect until the mid 1920s, but afterward there were still licensed dealers who paid only a small fee. The opium bottles from the cannery appear to have held small amounts, and are generally unmarked (I’m not sure if they originally had any sort of paper label). The designs vary, including round and square. The glass tends to be very thick, with a small channel in the center which held the drug. 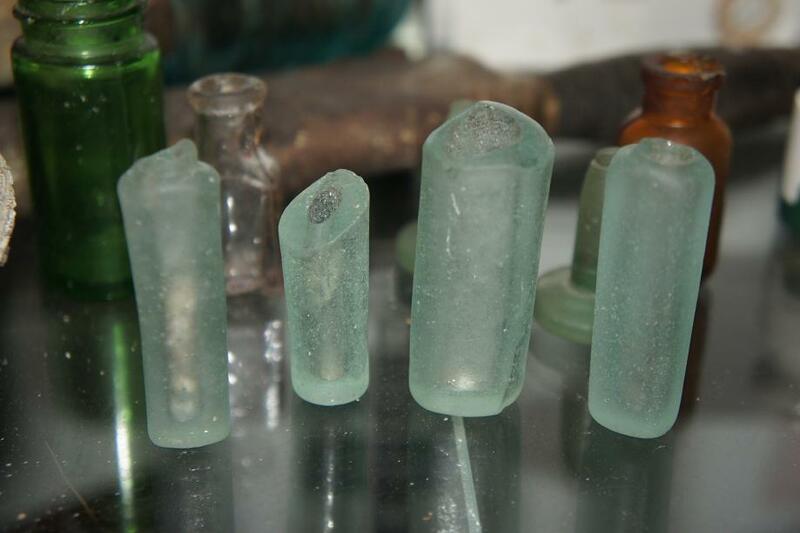 Many of the tops are smashed or broken, I have heard that these were often sealed with a blob of glass, and to open them you would simply break the neck of the bottle. In the early 20th century, drugs and alcohol were part of the typical cannery’s business plan. The cannery owners had a captive market in their seasonal labor, and workers were already on the hook for room and board, and possibly for transport in the case of migrant workers. Drugs and/or alcohol were another way for the company to recover wage expenses. They held a monopoly on the recreational substances, and could sell them to the workers at a high markup. A report from 1924 details some of these labor abuses, including unsanitary transportation, overpriced food, paycheck scams, etc, which could leave employees in debt to the company at the end of the season. The report also mentions other drugs distributed by cannery bosses, including cocaine and marijuana. 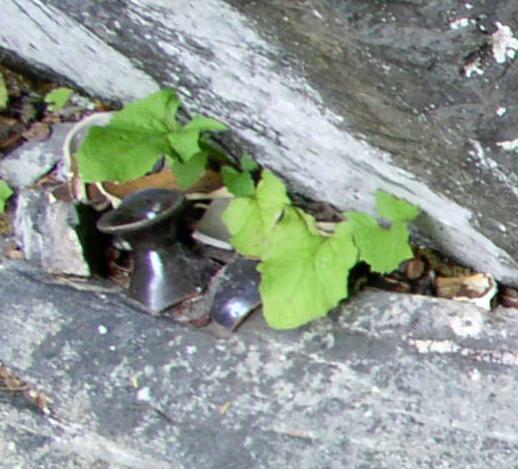 Here is a photo of a bunch more opium bottles, similar to the ones found at Funter. Pat Roppel has a good article on Opium use. She mentions a case where someone attempted to smuggle Opium via the mail boat Estebeth, a boat which called at Funter Bay and which has been mentioned previously. This article mentions the “medicinal” use of Opium: with 12-16 hour days of heavy manual labor, it was valuable as a painkiller to keep the workers moving. While opium and rice wine are often associated with Chinese cannery crews, the workers were not always of one nationality. Canneries employed local Tlingit natives in various positions (in fact, native employees dominated this cannery in the early years). Canneries later brought in Asian laborers from the lower 48 (Chinese, Japanese, and sometimes Korean immigrants). By the 1930s, Filipino and sometimes Mexican employees were more prevalent, along with some Puerto Rican and South American immigrants, often with Chinese managers or labor bosses. The casual racism of the period is obvious from reading contemporary documents and wage scales, white (European) employees received the highest pay and were usually in management positions, Asian laborers received less, and Tlingit workers were paid the least. Even after officially-sanctioned drug use declined, room and board at company towns was still costly for employees. Another article by Pat Roppel mentions a large amount of traditional Chinese food shipped to Alaska by canning companies, which was paid for out of workers paychecks (further details in this document). The expense of company meals could be mitigated somewhat by fishing and hunting. A 1933 report on Admiralty Island bears complained that cannery workers “seem inclined to kill every bird and wild animal they see”. A law, specifically aimed at cannery workers, banned hunting and nonresident gun ownership without a permit, supposedly as a game-protective measure. Companies employing seasonal workers were probably quite happy to support this law. Despite modern advances in labor laws and workers rights, recently a law was passed allowing canneries to again deduct room and board from employees pay, even if the resulting paycheck falls below minimum wage. This entry was posted on Saturday, May 18th, 2013 at 11:28 am and is filed under Alaska History, Funter Bay History. You can follow any responses to this entry through the RSS 2.0 feed. You can leave a response, or trackback from your own site. Find articles on Funter Bay very interesting….a part of history Greg and I would have missed out on…..thanks for the info. Thanks Gabe for these post! I will be in Funter Bay tomorrow with brothers Mark and Craig! Thanks for doing all the research to benefit the rest of us!! Funter is truly a special place! Wish your family were still there ….many great memories though.